Published by the DOI Departmental Consulting Archeologist/NPS Archeology Program, National Park Service, Washington, DC, November 1990 (Revised April 1992). This Technical Brief describes how National Historic Landmarks (NHL) Survey theme studies can be combined with basic elements of historic preservation planning to create a comprehensive framework for identification, evaluation, designation, and treatment of nationally significant archeological properties. An example, the "Historic Contact Period in the Northeast United States" NHL theme study, currently being prepared by National Park Service (NPS) Mid-Atlantic Region staff, will be used to demonstrate this process. In the short-term, this NHL theme study serves as a historic context document to nominate and designate as National Historic Landmarks 26 properties associated with the Historic Contact period between 1497 and 1783. Its long-term benefit, however, is that it can be used as a model for preservation planning and as reference by Federal agencies, State and local historic preservation offices, Indian communities, and others. Historic contact between Indians, Europeans, and Africans has played a major role in shaping the national experience of the American people. The circumstances and consequences of historic contact, moreover, differ in various parts of the country. While this theme study examines historic contact in a specific region, its unique value lies in its potential to be used nationwide as a preservation planning model. Agencies and individuals nationwide who are interested in the Historic Contact period can then use this theme study as a model, with modifications, to prepare appropriate historic context documents that will help increase public awareness of this critical period in the country's history. Specifically, frameworks and information presented in the following pages can be employed in the future to nominate other properties of transcendent national significance as NHLs and propose other properties on different levels of significance for listing in the National Register of Historic Places and other registers. This is the second Technical Brief prepared as part of the Federal Archeological Assistance Program NHL initiative. Technical Brief No. 3, "Archeology in the NHL Program," explains the program and describes how archeological properties are nominated and designated. The upcoming Columbian Quincentenary reminds us that few events have influenced the course of human history more than the encounter between the peoples of the Old World and the New. Contact between Indians, Europeans, and Africans released a stream of ideas, products, and people that continues to flow undiminished across the Atlantic Ocean. This "Columbian Exchange" brought people living on both sides of the Atlantic into a wider world than any known by their ancestors (Crosby 1972 and 1986). Scholars commonly refer to these first centuries as the "Historic Contact Period" (Fitzhugh 1985; Trigger 1978; Washburn 1988). Beginning during the early decades of the 16th century, the Historic Contact period continued throughout the colonial era. It was a time of unprecedented cultural change for both Indians and the Europeans and Africans who moved into their territories. The effects of this encounter forever changed the course of world history. Demographic shifts of unprecedented size and scope transformed the Atlantic community. Epidemic diseases and wars killed tens of thousands of Indian people (Dobyns 1983; Ramenofsky 1987; Snow and Lanphear 1988; Spiess and Spiess 1987). Far from this being a "Virgin Land," historian Francis Jennings has shown that these demographic catastrophes depopulated entire regions, transforming many heavily populated areas of the Northeast into a desolated "Widowed Land" (Jennings 1975). Migrants from the Old World rushed to repopulate this widowed land. European population throughout the region rose from nearly nothing to more than 1,800,000 between 1610 and 1780. Nearly 500,000 African people also were living in the region by 1780 (McCusker and Menard 1985:218-221). The newcomers struggled with Indians and each other for control of the land. Some Indian territory, such as the Pequot country in Connecticut, the Esopus lands in southeastern New York, and the Powhatan lands in Virginia, was seized in wars. Many colonial governments, however, used deeds to legitimate acquisition of, and extend sovereignty over, Indian lands (Jennings 1975:135-138; Springer 1986). Indians did their best to slow the rate of loss and strike the best possible bargains. In the end, however, they lost nearly everything. By 1783, virtually all lands within what became the first 13 states had passed from Indian hands. The original owners were forced to adapt or leave. Once the land was obtained, speculators, powerful proprietary lords, and government administrators competed for settlers, servants, and slaves to make it productive. Black slaves, white indentured servants, and free farmers of both groups cleared Indian fields and forests from Maine to Virginia. Many aspects of these relations have been extensively examined (Land, Carr, and Papenfuse 1977; McCusker and Menard 1985; Smith 1959). Not surprisingly, much of this attention has focused upon colonists (cf. Cronon 1983:228-235 for a particularly useful bibliographic survey of important North and Middle Atlantic sources). More studies, however, are tracing Indian participation in the colonial economy. They show that many Northeastern Indians worked as fur traders, guides, herbalists, or food providers. Others joined the cash economy as laborers, millworkers, whalers, or artisans producing wampum shell beads, splint baskets, or straw brooms. Not all Indian labor was free. Indians falling into debt often were forced into indentured servitude. Others apprenticed themselves to colonial masters. Indian war prisoners or convicts also often were enslaved (Kawashima 1986 and 1988; Lauber 1913). Comparatively little is known about relations between Indians and African Americans in the Northeast. Gary B. Nash's Red, White, and Black (1974) continues to be one of the best general surveys of the subject. Several studies have examined relations between the two peoples in colonial Virginia and the Chesapeake region (Craven 197 1). Aspects of intermarriage, legal status, and labor in New England have been addressed (Kawashinia 1986; Woodson 1920). Historic Contact is a diverse and complex era of American history. Much more remains to be done to fully document and interpret this crucial time of intercultural relations. The "Historic Contact Period of the Northeast" National Historic Landmark (NHL) theme study synthesizes documentary, archeological, ethnographic, oral, environmental, architectural, and other evidence of historic contact between natives and newcomers in the colonial Northeast from the Atlantic Coast to Ohio Valley between 1497 and 1783. Its objective is to establish a national-scale historic context for resources associated with NHIL Subtheme D, "Ethnohistory of Indigenous American Populations " within Theme I, "Cultural Developments--Indigenous American Populations." 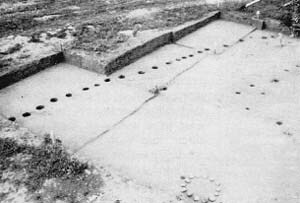 Figure 2.Sunwatch Site, Ohio. 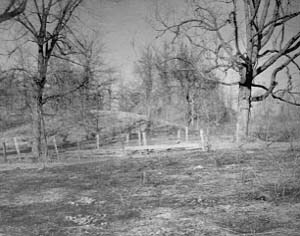 View of excavations of the stockade and solstice features. An objective of the NHL archeological initiative is to recognize properties that represent important developments in understanding the nation's cultural past. The study region comprises what is today the northeastern quarter of the United States. It stretches in an east-west direction from the Atlantic seaboard to the State of Indiana. The northernmost reaches of the region extend from Maine to Michigan. Kentucky and Virginia constitute the southernmost States considered in this theme study. The study focuses upon the first three centuries of Historic Contact in the Northeast. It is recognized that contact has never ended between Indians and other Americans of European or African descent. Intercultural contacts postdating the American Revolution, however, differ substantially from those of the Colonial era. More recent developments should be considered within NHL themes associated with later periods. This theme study is an interdisciplinary project and requires the cooperation of a wide range of specialists. This includes the assistance of skilled governmental personnel familiar with regulatory and administrative procedures associated with cultural resources programs. Input from the people who are the object of study also is essential. Recognizing the complexity of such an undertaking, National Park Service (NPS) Mid-Atlantic Regional Office (MARO) Preservation Planning Branch staff have worked closely with other Federal agency and State Historic Preservation Office (SHPO) personnel, Indian community representatives, and members of the professional and avocational preservation community in the Northeast throughout all phases of this project. The Ward's Point Site, New York. Historic preservation planning consists of many components. Its centerpiece, however, is the historic context. Historic contexts provide a framework for the identification, evaluation, designation, and treatment of cultural resources associated with particular themes, areas, and time periods. The Secretary of the Interior's Standards and Guidelines for Preservation Planning detail procedures for developing historic contexts. These include collecting and synthesizing appropriate information, defining property types, and identifying areas to be surveyed for cultural resources (National Park Service 1983). Historic context-based planning permits recognition of individual properties as parts of larger systems. Historic contexts also help managers and others evaluate properties within proper levels of significance. As such, they provide both a systematized basis for comparison and a comprehensive frame of reference. In so doing, historic contexts provide cultural resource managers and those whose activities affect historic properties with a guide for rational decision making. All SHPOs and many Federal agencies, county governments, local municipalities, and other organizations are currently developing or implementing historic context-based preservation plans. Most focus upon specific regions, resource types, or time periods. At the present time, most preservation plans deal with cultural resources located within State boundaries. Few extend their purview beyond State lines. Although Federal agencies such as the U.S. Army Corps of Engineers and the U.S. Forest Service produce regional plans spanning State boundaries, the National Historic Landmarks theme study program presently is the only process for organizing information wholly devoted to systematic identification, evaluation, and designation of cultural resources on a national scale. The NHL thematic framework classifies American historic and archeological places that meet the NHL criteria for national significance. As such, it "is a comprehensive outline of United States prehistory, history, and cultural endeavors" (National Park Service 1987:i). The NHL Thematic framework "is used to show the extent to which units and cultural resources of the National Park System, affiliated areas, and National Historic Landmarks reflect the nation's past." Thus, it may by used to capably and efficiently guide analysis, classification, and assessment of historic properties of potential national significance. The NHL thematic framework can be used to identify future directions for planning and study through assessments of how representative a property is in relation to the overall framework of American cultural history. (2) Identification of known and expected groups of related resource groups known as "property types;"
(8) Integration of historic context information in broader management processes. The MARO Preservation Planning Branch staff identified the need to develop a planning document for the management of Historic Contact period cultural resources in the Northeast in a series of meetings and discussions with Federal, State, and academic archeologists and planners in 1987 and 1988. Many of these discussions were motivated by newly instituted programs supporting development and implementation of statewide historic preservation plans mandated by NPS for recipients of Historic Preservation Fund grants-in-aid. All discussants recognized the desirability of systematizing information on a regional scale. Few SHPOs, however, had developed a historic context for Historic Contact period resources in the 17-State region served by MARO. These developments coincided with discussions formulating the NPS Archeological Assistance Program's Archeological NHL initiative. The primary goal of this initiative is to improve representation of archeological resources in NHL listings. The MARO Preservation Planning Branch staff linked regional interest in the Historic Contact period with NPS preservation planning and archeological NHL initiatives during the Fall of 1988. Preliminary project goals and objectives were drafted. Recognizing the need for extensive cooperation between agencies and the preservation public for implementation of these goals and objectives, MARO staff quickly established two advisory groups to guide project development and provide technical assistance. The first of these consisted of NPS personnel representing the NPS Archeological Assistance, History, Anthropology, and Interagency Resources Divisions. The second advisory group comprised designated SHPO coordinators from the 17 States within MARO and Kentucky. The SHPO coordinators fulfilled a vital role as liaison between MARO and preservation publics within individual States. Distributing theme study announcements and other materials to Indian Tribal groups, specialists, archeological societies, historical societies, and others, SHPO coordinators collected theme study information, assessed data quality, and provided review comments on project scope, content, and direction. The MARO staff developed initial project goals, methods, scope, and schedule requirements during the last months of 1988. Two years were allotted for project completion. An announcement describing the project was mailed to program advisors. The SHPO coordinators distributed this announcement to their States' preservation publics for comment. Special emphasis was placed upon distributing project announcements to all Indian communities within each State. Several States facilitated this process by publishing the announcement in their SHPO or State Archaeological Society newsletters. NPS personnel initially reviewed and revised project goals and priorities. Informal discussions with SHPO coordinators conducted by telephone and at professional meetings further defined and refined project goals, form, and purpose. The First Joint Archaeological Congress, held in Baltimore, MD, January 5-9, 1989, presented a particularly advantageous opportunity for MARO staff to meet with many SHPO coordinators and other scholars and preservationists. Discussions held at the Archaeological Congress focused upon issues of resource identification and evaluation. How, many archeologists asked, would potential NHLs be identified? Would standing structures be included? Would all properties associated with the Historic Contact period be surveyed, or would inventory be restricted to nationally significant cultural resources? Would the project report be an exhaustive scholarly treatise or a relatively brief and simply worded management document? How would evaluation criteria be determined? Would evaluation guidelines be developed only for nationally significant properties, or would they be defined for all associated resources? Figure 3. Menard-Hodges Site, Arkansas. View of Main Mound and one of the adjoining mounds. Menard-Hodges is another of the newly designated archeological NHLs. The NHL archeological initiative also is intended to improve documentation on sites and recognize significant characteristics such as monumental engineering in prehistory. The main thrust of these and other questions centered around the project's purpose and scope. Strong support was indicated for development of a planning document that could easily be adapted to statewide historic preservation planning requirements. Members of the preservation community further expressed strong interest in development of far-reaching significance statements under which large numbers of properties could be identified, evaluated, and designated at all levels of significance. The MARO staff responded to these comments in a detailed project outline distributed one month after the Archaeological Congress. The SHPO coordinators distributed copies of this framework to all preservationists and Indian communities in their States. Figure 4. Sunken Village, Oregon. View along the length of the site. 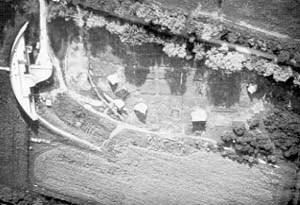 Sunken Village Is a newly designated archeological NHL that recognizes the importance of wet site archeology for understanding the full richness of prehistoric material culture. This outline contained the first presentation of a national level historic context. It began with a brief discussion of the purpose and scope of the project. This was followed by a listing, including telephone numbers, of all NPS and SHPO advisors. Next, project theme, sub-themes, geographic area, sub-areas, and chronological organization were presented. Listings and maps correlated late prehistoric and protohistoric archeological complexes with historic Indian and European ethnic groups. A framework for property type delineation was presented. This information was followed by lists tabulating findings from surveys of designated nationally significant Historic Contact properties. The first tabulation assessed existing NHL theme representation in the project area. A second listing cross-indexed these data by State. This was followed by a listing of Historic-Aboriginal National Register properties recommended as nationally significant by their nominating authorities compiled during a National Register Information System (NRIS) computer search. The outline ended with a preliminary listing of potential NHL designees identified by SHPO coordinators and individual preservationists. Numerous helpful suggestions for revisions and refinements were received in responses sent to SHPO coordinators throughout 1989 and 1990. Modifications in project categories and boundaries, changes in regional Historic Contact period context development, and a survey of existing State and Local inventories were suggested. Respondents also identified 26 potential NHL properties located in 12 States. Many archeologists provided particularly valuable assistance correlating late prehistoric or protohistoric archeological complexes with ethnohistorically or ethnographically documented Tribal groups. Specialists recommended several critically important area studies and brought pertinent bibliographic citations to the attention of the MARO project staff. Matters of nomenclature and topology presented particularly challenging problems. Differences of opinion among archeologists, now superseded research priorities, and gaps in the archeological record have long affected attempts to reconcile State and regional variations or inconsistencies. By influencing analyses of terminal Late Woodland period diagnostic artifacts, these factors often make it difficult to identify and understand cultural dynamics in the study area. Information received from SHPO coordinators revealed that fewer than half of the States within MARO had developed historic contexts covering the period of Historic Contact. This survey also indicated that less than half of the States had prepared listings or established computerized access to information bearing upon Historic Contact period properties. Review of available SHPO survey information, moreover, indicated that only a limited percentage of the many hundreds of sites mentioned in historic documents had thus far been inventoried. Discussions with SHPO coordinators revealed that variations in survey scope and coverage were largely functions of funding limitations, competing program priorities, shortages of computer equipment, unavailability of automated data management personnel, or differences in State data categories, topologies, or research orientations. Despite these variations, SHPOs provided enough information to make preliminary delineation of known property distributions, identify known and expected property types, and formulate theme study goals and priorities. Unsurveyed areas and unanalyzed bodies of data were identified for further study. Among project goals and priorities were recommendations that all SHPOs develop historic context documents for the Historic Contact period, inventory presently unsurveyed areas, and study unanalyzed collections. SHPO recommendations further supported using computerized systems for inventories. Previous NHL theme studies identified undesignated properties, listed related sites classified as having exceptional value in other themes, and recommended other sites for further study. The Northeast Historic Contact NHL theme study expanded upon this tradition by listing all pertinent properties thus far inventoried within the project area. Review of National Register nomination forms showed that properties associated with the Historic Contact period in the Northeast rarely were identified or evaluated as a group. Instead, virtually all previously listed sites or districts were individually nominated. Examination of property representation within NHL theme categories also revealed that Historic Contact period cultural resources are not proportionally represented. Research emphases of earlier NHL theme studies resulted in few designations of Historic Contact period properties in the Northeast. Particularly telling was the discovery that relatively few northeastern historic contact properties were identified in theme studies dealing with the colonial era (Sarles and Shedd 1959a, 1959b, and 1960; Shedd 1959 and 1961). Properties designated in these studies tended to represent the European side of the encounter between the peoples of the Old World and the New. When considered at all, Indians generally were described as obstacles to frontier expansion. This identification is graphically illustrated in the high percentage of forts designated. The single theme study devoted to the Indian side of Historic Contact, entitled "Contact With the Indians," presented a large body of information of potential significance to the study of Indian-colonial relations in the Northeast (Holder 1963). Only two of the 30 sites designated by this theme study, the Accokeek Creek site, in Maryland, and the Boughton Hill site, in New York, were located within the region. Two factors largely determined this particular pattern of representation. First, most of the best known Indian historic contact sites identified prior to 1963 were located west of the Mississippi River. Second, the archeology of Indian historic sites in the Northeast was not yet extensively developed at the time this theme study was published. The recent explosion of scholarly activity associated with Historic Contact period studies in the Northeast contributed to the identification of the hundreds of properties listed in the theme study document. Interestingly, only one of the properties nominated as NHLs in this study, the Minisink site in New Jersey, was identified as a potential NHL site recommended for further study in earlier theme studies. All but four of the present 26 NHL nominees, however, are listed in the National Register of Historic Places. Less than half of these listings were recommended as nationally significant by the nominating authority. Most instead were assigned the level of State significance..
Four properties, Old Fort Niagara and Ward's Point (the Billopps or Conference House) in New York, St. Mary's City, Maryland, and Camden, Virginia, are located within or nearby areas already listed as NHLs. None of these designations currently recognize cultural resources associated with Historic Contact. Project participants identifying these properties propose to expand their level of documentation to include consideration of this period. Several potential NHLs not associated with the theme study also have been identified during the project. At least two of these, Flint Ridge in Ohio and the Coxsackie Flint Quarry, in New York, may be individually nominated as NHLs sometime in the future. Individual archeologists presently are supporting the initiative by voluntarily collating basic, available information associated with identified properties. In keeping with project goals restricting research to syntheses of existing data, archeologists have not been called upon to collect new information, analyze unsynthesized data, or prepare new text. Following acceptance of resource boundaries and affirmation of owner consent by the NPS History Division, archeologists will be asked to provide pertinent data or references to key citations. Finally, they will review products prepared by project personnel and comment upon all theme study drafts. [Properties] that have yielded or may be likely to yield information of major scientific importance by revealing new cultures, or by shedding light upon periods of occupation over large areas of the United States. Such sites are those which have yielded, or which may reasonably be expected to yield data affecting theories, concepts and ideas to a major degree (emphasis added). Figure 5. Sunken Village, Oregon. View of a storage feature. 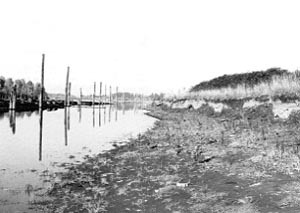 Many materials and objects used by Chinook people at this site prior to the arrival of Euroamericans are well preserved because they are submerged or constantly wet. High priority has been accorded to nationally significant properties associated with subthemes, facets, and subthemes not represented or underrepresented in the NHL Subtheme D, "Ethnothistory of Indigenous American Populations." Designation of properties located in States or regions not containing existing NHLs associated with Historic Contact also was accorded high priority. High designation priorities further were assigned to properties associated with Historic Contact period Indian cultures identified in the theme study not presently represented in the NHL framework. Site integrity plays a major role in determining designation priorities for nationally significant resources. A relatively well-preserved property possessing high potential to yield nationally significant information was assigned a higher preservation priority than a poorly preserved, fragmentary, or substantially disturbed site. 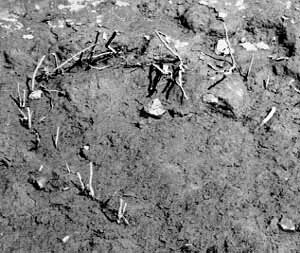 The integrity of archeological deposits may not always be a major consideration in properties in which archeological values are not of primary importance. Figure 6. Sunken Village, Oregon. 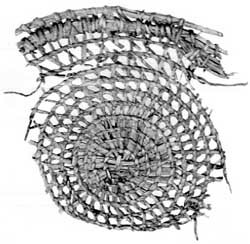 Cedar bark weaving. The extraordinary preservation at Sunken Village means that organic materials such as bark and wood deteriorate slowly, providing archeological analyses with a more complete sample of past lifeways. Previous NHL theme studies frequently assessed properties not chosen for designation. Others listed properties recommended for future study. Many such properties were classified as having exceptional value in other themes. Others were recommended for further study within the same theme. The present theme study has built upon this tradition of considering a range of potential NHL nominees by using the National Register of Historic Places criteria to preliminarily determine the significance of all inventoried properties associated with the Historic Contact period. These evaluation criteria have been applied to all theme study categories and topologies. By combining NHL and National Register significance levels and evaluation criteria, this theme study provides government agencies, Indian communities, and others involved in preservation activities with the widest possible framework for the evaluation of nationally significant Historic Contact resources. Historic context-driven goals and priorities should be considered whenever actions potentially or actually affect associated cultural resources. Agency planning can identify appropriate preservation procedures. Plans also can minimize impacts of unanticipated situations. Plans are created in a real world in which preservation is only one of many factors considered in any action. Historic context goals and priorities sometimes can be distinct from certain management considerations. They cannot, however, be exclusive. Preservationists and project managers must work together to balance historic context driven planning objectives with agency or Tribal programs and project requirements. The NHL program presently addresses several practical considerations in resource designation. The wishes of landowners and other interested parties, for example, are taken into account in any NHL undertaking. Private owner objection is a legal barrier to designation. Objections from interested parties also raise significant concerns that must be addressed directly. Goals and priorities developed by this theme study reflect the importance of this issue by requiring that landowners consent to NHL nomination of their properties prior to study. By explicitly considering such vitally important issues, this theme study has become a more effective preservation planning management tool.